This past October, in observance of Breast Cancer Awareness Month, The Pink Fund partnered with the clothing brand,Wrapped in Love. Wrapped in Love is an amazing fashion line that caters to cancer patients. The brand has fleece wraps, ponchos, head wraps, sleeping caps and scarves for warmth,comfort and some style. Karen MacDonald, founder of Wrapped in Love, shared her inspirational story with Women’s Wear Daily. MacDonald makes her clothing practical for the cancer community by understanding some of the side effects of the disease. For example, some patients that experience post surgery drainage will find that each zip-up top provides four drain pouches that are hidden inside the garment with velcro, and may be removed after the pouches are no longer needed. It’s common that patients are very cold while undergoing chemotherapy. Wrapped in Love features a variety of styles that provide warmth, are easy to slip over the shoulders, and come in beautiful colors, all with a signature flower. 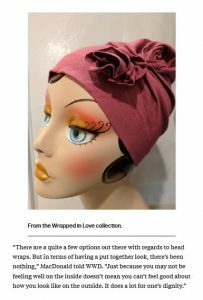 Wrapped in Love features gifts by category including, post surgery, head wraps for hair loss, hot flash/lightweight clothing, breast cancer, chemo patients and many more. We are very grateful that during the month of October, Wrapped in Love donated 30% of all of their Pink product sales to The Pink Fund. Click here to download the full article in WWD.